The Beltquerung 2003 was influenced by the clima conditions. The Solo-Beltquerung of german Kirsten Seidel has to be cancelled and postponed to the 17.008.2003, so two days later. As planed starts the NationenCup with the first danish team of the history of the Beltquerung the 16.08.2003. The attempt was cancelled by Nick Filtenborg. His team partner Anni Jakobsen can not help him. The conditions are right. We hope, that the danish relay will come back. The 17.08.2003, two days later than planned, starts Kirsten Seidel at 06:26 hrs in Rødby/Danmark. 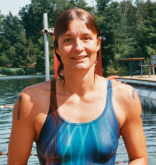 She is the first german female Solo-Swimmer of the history of the Beltquerung. After 9 hours and 03 minutes she arrives the finishbeach in Gammmendorf under frenetic applause of the waiting spectators. She tops the womenrecord of the argentine María Inés Mato, who is disabled, for more tan two hours!